I don’t know what tipped the balance, but I’m really pleased I finally gave this dish a try. It turns out that chargrilled broccoli is delicious, especially tossed with sautéed garlic, chilli and slivers of lemon. And because I halved the quantities, it wasn’t as time consuming as anticipated. The original recipe comes from Ottolenghi, The Cookbook. Bring a large pot of water to a boil. Add the broccoli and blanch for two minutes. Transfer to a bowl of ice water to stop it cooking further. Drain and dry the florets well. 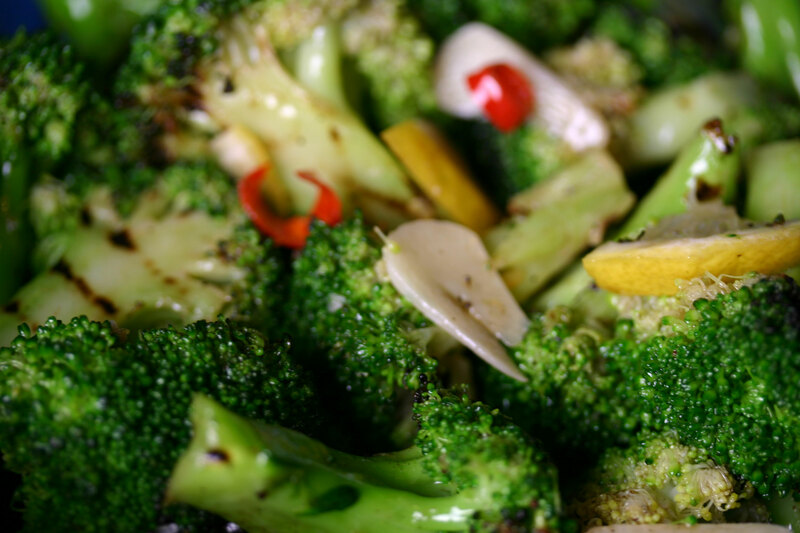 Toss the broccoli with one tablespoon of olive oil and season to taste with salt and pepper. Heat a grill pan over high heat. Cook the broccoli, in batches if necessary so as not to overcrowd the pan. Turn regularly, until the broccoli has char marks on all sides. Transfer the grilled broccoli pieces to a serving bowl. Heat the second tablespoon of olive oil in a small pan over medium low heat. Add the garlic and chilli and cook for a few minutes, taking care not to overcook. Pour the garlic-chilli oil over the broccoli and toss well. Add the pieces of lemon and adjust the seasoning. it does sound very tasty and also makes me think that I really do need that Ottolenghi book, too. I do cook more from Jerusalem, but there are some gems in the first book as well.